The “Pou Kapūa Taonga” is a significant Maori/Pacific Indigenous cultural arts project. Its creation and project management was led by Master Carver Wikuki Kingi Jnr, QSM and Tania Haerekiterā Wolfgramm-Kingi. The Pou Kapūa was carved from a magnificent ancient kauri from the forests of the Iwi of Te Rarawa, stands more than seventy feet high, and is the largest totem of its type in the world. 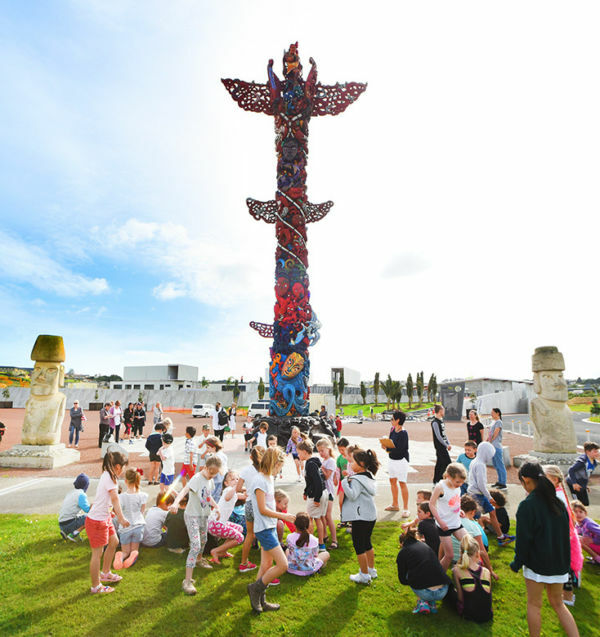 The stories carved onto the Pou Kapūa is based on Maori and Polynesian creation beliefs and legends and also reflects the stories of migration to Aotearoa New Zealand. Working on Pou Kapūa was a dedicated team of four master carvers, five team carvers, five apprentices, hundreds of volunteers and suppliers and have also received generous support of numerous groups, organisations, businesses, trusts, individual and corporate sponsors, funding agencies and the Auckland City Council. Other Pacific and Indigenous carvers have traveled to New Zealand to take part in the carving. Inuit carver Frank Wolfhead from Glacier Bay, Alaska, and Professor Anthony Dieter from the Cree Nation Saskatchewan, Canada have, on behalf of their peoples, contributed to this kaupapa by carving their ancestors on Pou Kapūa. Cook Island carver Tavita also spent hundreds of hours carving their stories and figures on the Pou. Two carvers, Tomas Tukitepano and Luis Hey Chavez from Rapanui/Easter Island also carved two 3 metre high moai (Easter Island figures) from hinuera stone. Pou Kapūa was finished in 2005 and is located at the centre of the plaza between the Vodafone Events Centre and Vector Wero Whitewater Park.